MINERALS FROM THE COLLECTION OF THE ROYAL GEOLOGICAL SOCIETY OF CORNWALL . 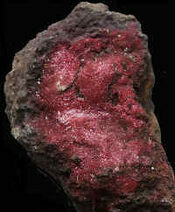 A very rare variety of Copper Oxide with very fine hair-like crystals.Often showing a rich scarlet red colour. Royal Geological Society of Cornwall collection's. Many are extremely rare and unobtainable now and represent specimens that were collected when the Mines of Cornwall were World Famous and working in the 19th and 20 Century.Hence they are very important to preserve and display in Cornwall to enhance the status of the WORLD HERITAGE SITE OF CORNISH MINING awarded and recognized by UNESCO. Locality;North Herodsfoot Mine,Herodsfoot Mining District,Lanreath,Near Liskeard,Cornwall. The grey crystals of Bournonite have been termed "cog-wheel-ore."
for interesting talks and lectures, each month, and opportunities to meet similar people who have an interest in collecting Minerals,Fossils and Gems and Crystals,Mining History and Geology. We go on interesting guided field trips in the spring and summer months which will allow members to collect their own specimens and learn about the Geology of sites and the specimens collected.Access to some sites is unavailable unless linked to a Society like the Royal Geological Society of Cornwall. The Society has been publishing papers on geological subjects for over 200 years and these are still often quoted as the original references on many subjects.The Royal Geological Society of Cornwall is the oldest Geological Society in the World, with the longest run of printed scientific papers,Transactions,on Geologically related subjects. Recent Publications and FUTURE PUBLISHING PLANS FOR 2018. As well Field Meetings and Talks and Lectures the Publication of Transactions, are provided as a benefit of Annual Membership. Those in print at the moment are our Bicentenary Issue published in 2014,the DVD of our Index of subjects and authors from 1814-2015,published in 2015 and a major issue we are preparing to publish on the Fossils of Cornwall will be available in 2018.Such publications are included within the Annual cost of Membership to the RGSC. Two things we plan to encourage during the meetings we hold, will be the opportunity for younger members to learn how to identify their rock and mineral finds and to exchange or swop with others who attend our functions. BOOKS ON DINOSAURS AND FOSSILS AND GEMS AND MINERALS. A project for the future is that we plan to create a new Library of books about Geology. GROUP,also an ARCHAEOLOGICAL GROUP -as ancient Stone Age,Bronze Age,Iron Age Celts were all good geologists who had to find their metallic ores and rock resources. Also a group interested in microscopes. 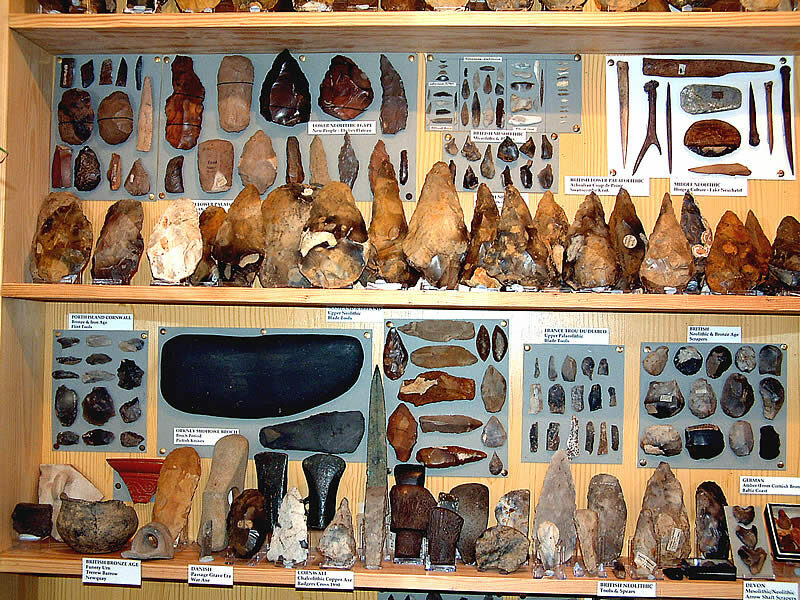 This is a small cabinet of Flint,and hard-rock implements,and copper metal and bronze tools.Also bone and deer antler tools and iron picks and fragments of pottery. Ancient people had to source the metals,the special kind of rocks required and learning the techniques and technology of making their tools by hand and finding their clays and resources that they needed to survive. Just as we do today! Can you spot the arrow heads and hand axes and spears made of flint ? Bronze and Iron? LOCALITY: Wheal Edward,Near Botallack,St.Just in Penwith,Cornwall. 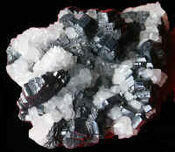 (Quartz is a very common mineral on earth and is composed of Silica and Oxygen). It is very abundant in our Cornish Granites because the hot molten magmas that the Granites came from were very rich in Silica. The surplus silica upon cooling crystallized as quartz. 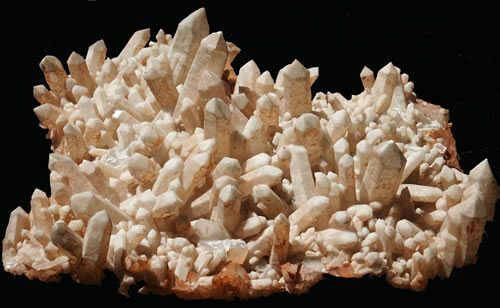 The crystals in the specimen shown here,if you look carefully are hexagonal,(six sided) in cross section and pointed in what we call a termination.This is because the Oxygen and Silica elements combine together in six sided formations and why the crystals are six sided. If you are lucky this is one of the first minerals you should be able to collect yourselves.have you ever found rounded and polished quartz pebbles on any Cornish Beaches ? Look again at the other specimens above and see if you can identify quartz in those samples.